"The Great Turning Point," the first chapter in Lambert Zuidervaart's Religion, Truth, and Social Transformation, stands as an object lesson in the spirit of critical engagement practised at the Institute for Christian Studies: at once a fidelity to the tradition out of which it emerged and a critical eye and ear toward the Creation that tradition holds in such high regard. The result of such a critical engagement is what Lambert calls "critical retrieval" -- whereby we acknowledge valid objections to the philosophies local to our tradition and, in light of such objections, provide a redemptive critique. The impetus behind such a critical engagement is a non-oppositional cross-pressure between a firm commitment to the goodness of Creation and the recognition that all claims rest upon an ontology that is never all-together apparent to those making the claims. This cross-pressure is the catalyst for what should be called a "faithful divergence" not only by the subsequent generations but by figures within the generations themselves. How appropriate it is for a Reformational philosopher to close an essay that explicates the "puzzles" or "challenges" of his philosophical tradition with a claim that those very puzzles or challenges constitute the productive power of the tradition itself. Such a closing is a crystallisation of the cross-pressure mentioned above. Now, Lambert lets his readers know at the outset that it is not the purpose of nor does he have the space in this essay to articulate a substantial alternative to both HD's circularity and the two aforementioned attempts. How fortunate we are, however, to be participating in a blog event such as this so as to prompt the author, as well as the other event contributors, to be more liberal with prescriptions than one is willing or able to be in formal publications! 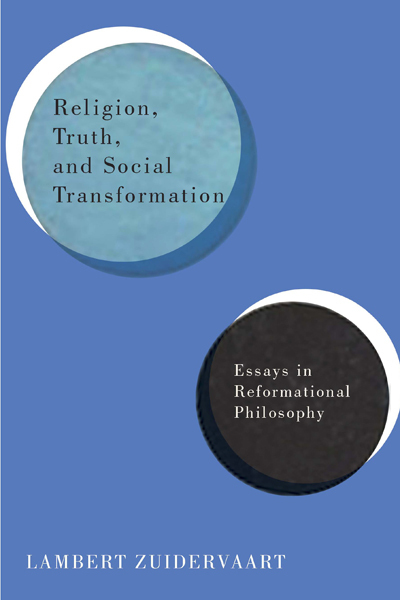 In light of this new found freedom, I would like to propose that the "transformational" approach developed by Klapwijk, while growing out of a concern over the problems surrounding the antithetical/synthetical self-understanding of Christianity's relationship to philosophy, may nevertheless offer possible ways forward with regards to the deeper philosophical problem in HD of thinking the limits of theoretical thought. If we accept the idea of transformational philosophy as the critical appropriation and incorporation into Christian reflection of systematic conceptions from the general history of philosophy, then the dynamic character of this general history must influence the Christian reflection in some way. [...] The progress of Christian philosophical thought is determined not only by the internal dynamics whereby Augustine learned from Ambrose and Origin, Calvin from Bonaventure and Augustine, Dooyeweerd from Kuyper and Calvin, and so forth. The progress of Christian philosophical thought as transformational philosophy is also determined by an external dynamics, say by the developments that have lead from Plato to Wittgenstein. I mean, Augustine was about as able to ignore the platonist idea of a diversity of levels of being in his thought as we are to ignore Wittgenstein's notion of a diversity of lingual fields. God created "in the beginning" a becoming world in the sense that the cosmos universe, the earthly forms of life, and the world of human beings would reveal themselves subsequently in phases in a temporal process. God's creating acts thus did not result in a ready and finished product but in a dynamic reality, a world in progress. Creation is a driving force, a ground motive that propels the world from its origin to its final destination. [...] Without the propelling motive of creation, time would come to a halt, evolution would stagnate, emergent novelties would fail to appear, and the world would miss its final destiny. If we, bracketing for now Klapwijk's commitments regarding the particular eschatology and modality he has in mind here, take the latter use of dynamics regarding a fundamental ground motive underlying and propelling creation as an extension of his use of dynamics regarding the history of thought, then "transformational philosophy" in this extended sense could, if not provide the tools, at least prepare the ground for the fashioning of tools that could "salvage" an articulation of limit that does not result in circularity. For, in the same way that the dynamics of transformation engender a 'dialectic' between lingual fields internal and external to Christianity throughout history, so too could it (among other implications) engender a 'dialectical' relationship between theoretical thought and "that which is not theoretical". In many ways, Klapwijk's extended articulation of dynamics moves Reformational Philosophy away from those neo-Kantian influences flagged by Lambert in the beginning of the section and closer to the Hegelian corrective he implies at the end. In the same way that Hegel took Kant's 'problem' of the antimonies and reconceived them as the very motor of history by temporalizing the transcendental dialectic itself, so too may Klapwijk's extended articulation of dynamicity take HD's neo-Kantian understanding of the limit of theoretical thought and reconceive it as a dialectical pilgrimage to the Kingdom of God. “Antithesis, Synthesis, and the Idea of Transformational Philosophy.” Philosophia Reformata 51 (1986): 16. “Nothing in Evolutionary Theory Makes Sense Except in the Light of Creation.” Philosophia Reformata 77 (2012): 59. Jazz Feyer Salo is an MA student at the Institute for Christian Studies, focusing on philosophy of language and American pragmatism.